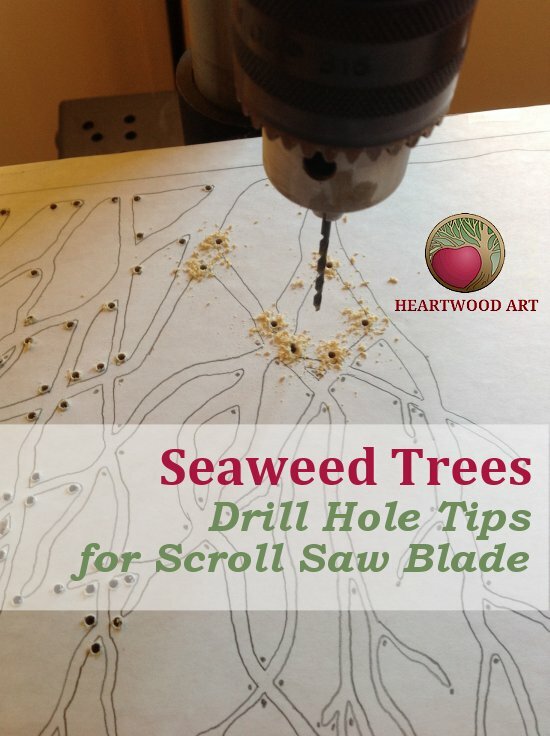 Creating the proper access holes for a scroll saw blade requires precision drilling. And the right drill speed, bit, and lighting can make all the difference. 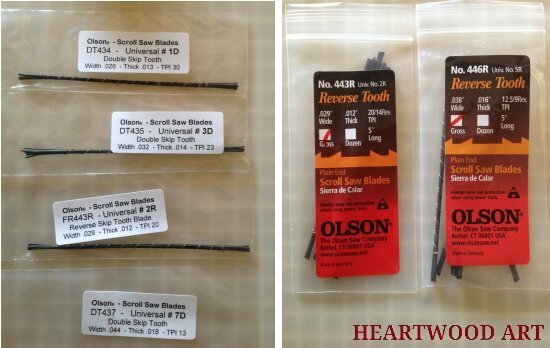 Scroll saw blades come in a wide variety of sizes, widths, and tooth configuration. Below are some of the blades I like. As you can see, they come in a variety of widths, thickness, and tooth type. I personally like blades that cut both ways for a couple of reasons. 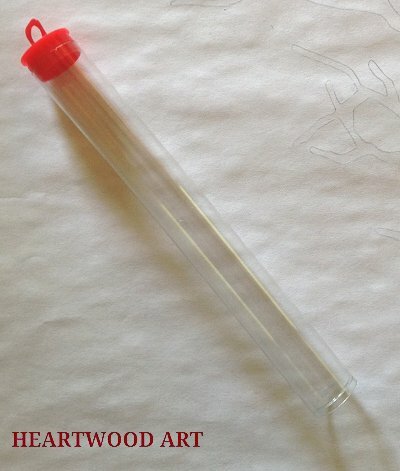 I like to keep a set of blades handy at the scroll saw in this type of tube. I don’t even remember where I got these. But, there is a nice little clip for it on my scroll saw and they stay within arm’s reach while I’m at the table. For folks scrolling super detail with lots of tight areas, a drill bit that is barely bigger than the blade would be appropriate. But, I’m not doing fine fret work with this project, so I like using the next size up to give me plenty of room to turn the wood without catching it on the blade. The drill bit sizes shown here are 5/64 (smallest) and then 3/32, which is the one I’m using. You can use a hand drill. But I find that a drill press makes holes faster, cleaner, and is far more accurate. I set the spindle speed at 1600 rpm. But, you can set it as high as 3000 for most soft woods, when using this small of a twist bit. You can also see in the image above that I have a good lighting source near the press. I like lamps with flexible arms so that I can direct the lighting where I need it most. Floor lamps like this go for $19 in many discount and big box stores. I like to keep the table height near to the bit tip. I don’t have to lower the bit very far, which speeds things up. And, it keeps the tip of the bit in my field of view for easily lining up the next drill hole. I give myself no more than 2” so I can remove the blank for dusting off without nicking it on the bit. Tip: You can blow off the sawdust, but I find it a lot easier to keep a tall trash bin handy and just dump them now and then. No scattered sawdust to clean up later. Depending on the wood, there can be a lot of tear out and jaggedness around the holes on the backside. These need to be cleaned up so that the blank will lay flat on the scroll saw table and move smoothly over it. I’ve always used solid wood for my carvings and had very little tear out with them. I’m using plywood for this carving study, and I probably should have set my drill speed higher to avoid this much tear out. Or, perhaps my bit tip is getting dull. Tip: I find it quick and easy to just touch each hole with the drill bit while on the press. You don’t have to go all the way through. Then, make a couple of light passes with heavy grit sandpaper to remove the rest of the splinters. The distance from the bit to the back of the press is not very deep. I still had to hand drill a few of the holes toward the center of the piece. For this, nothing works better than my Workmate opened all the way up and the center of the carving over the empty middle section. It’s time to start cutting! I’m tuning up my scroll saw right now. The letters and the wood surrounding it is needed. No waste area to drill in to. I have to drill right ON the pattern line. I have a hard time trying to hide those holes when doing that. I use the smallest possible blade. Any ideas for that type of scrolling? That’s super tough, Robert!! It sounds to me like you’re doing all that you can to minimize the drill holes. I wish I had a tip for you, but it really comes down to the design.